Creating a landscape design concept for your property is a key element to have in hand before starting any installation or construction project. Metrolina Landscape Design/Build services provide a scaled master plan drawing that creates a “road map” for your landscape and helps guide you to areas of concern and a starting point. Experienced designers work directly with owners to integrate needs and desires for all outdoor spaces while keeping site conditions, long-term beauty and maintenance in mind. 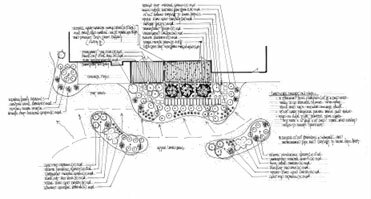 Several design elements that should be considered are public areas, private areas, screening, traffic flow, decorative beds, patio expansion and specialty gardens. Other key factors include sun/shade conditions and possible site microclimates for proper plant selections. Our experienced staff can provide accurate budget estimates based on a more thorough understanding of the property and design possibilities. Let our Design/Build team provide a turn-key service for your landscape from design to project completion. Metrolina Landscape serves clients that require the highest standards in our industry. For over 30 years we have built our reputation by working with discerning real estate developers, landscape architects, construction contractors, property managers and homeowners.